Silver Lake’s half-mile Rowena Avenue road diet. Photo by Joe Linton/Streetsblog L.A. In 2012, Ashley Sandau was walking across Rowena Avenue and was hit and killed by a motorist. Then-Los Angeles City Councilmember Tom LaBonge spearheaded efforts to make Rowena safer. The city Transportation Department (LADOT) implemented a road diet on Rowena. The street had two travel lanes in each direction. These were reduced to one travel lane each direction, plus a center left turn lane and bike lanes. LADOT studies have found that post-diet Rowena supports roughly the same volume of cars as pre-diet, but does so with reduced speeds and fewer collisions. A group of Silver Lake residents are frustrated with the Rowena road diet and urging the current Councilmember David Ryu to undo the safety improvements. Road diet opponents have a website and petition, and have attracted the attention of the L.A. Times. 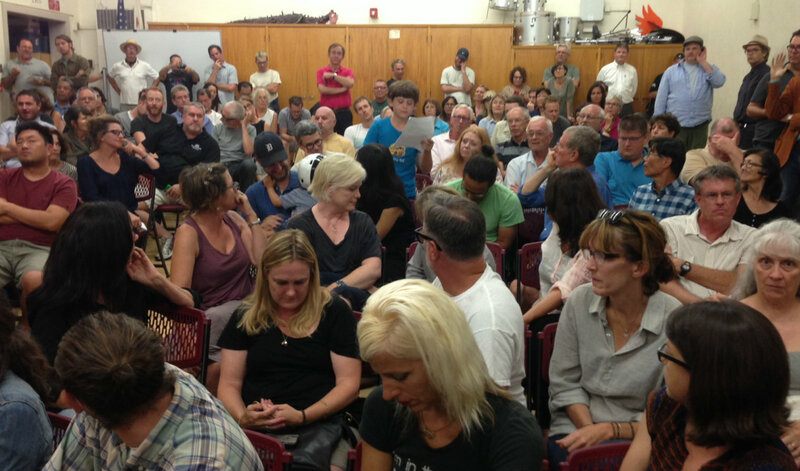 Last night, the Silver Lake Neighborhood Council held a town hall meeting to discuss the Rowena road diet. The event was held at Ivanhoe Elementary School. Approximately 200 people attended. After the questioning, the meeting shifted to public comment. While there were certainly vocal road diet opponents expressing comments, the sentiment ran about two-thirds in favor of the road diet, with many Silver Lake residents expressing that they do bike and walk, and do want to make the neighborhood more conducive to these modes. What was perhaps most remarkable was the unanimity in opposition to scofflaw drivers. While there was opposition to the road diet, there was practically no criticism of cyclists or bicycling. There was, however a constant chorus against the high volume of drivers not stopping at stop signs on Waverly and Angus, some of which were added by LADOT to address post-diet spillover. Numerous speakers implored LAPD to step up enforcement; others were critical of apps including Waze that foster increased cut-through traffic. Matlock Grossman (center in blue shirt) reads his comments at the Rowena Avenue forum. Photo by Joe Linton/Streetsblog L.A.
Councilmember Ryu’s representatives promised that there would be further dialog and engagement as they determine the city’s next steps for Rowena Avenue. Smart kid… couldn’t have said it better myself! Or his parent wrote it for him. Even if his did, I don’t care – it is exactly what needed to be said. Can anyone link to who was on the panel and what groups they’re affiliated with (if any)? Using your child as a proxy for your shrill opinions is disgusting. You might take a rhetoric lesson from him. Even if you just look at it from a motorist’s perspective, four lane streets with no center turn lane are annoying. Any time a car wants to turn left, it blocks the entire left lane. I’d say gaining the bike lanes and the left turn lane to make a street with safer speeds, that is less noisy, is well worth it. If traffic is cutting through the neighborhoods, put in some speed humps. And yeah, that kid is effing awesome. The only thing that could have made his speech better is dropping the mike and walking out. LAPD, Northeast Division, Captain Arturo Sandoval. 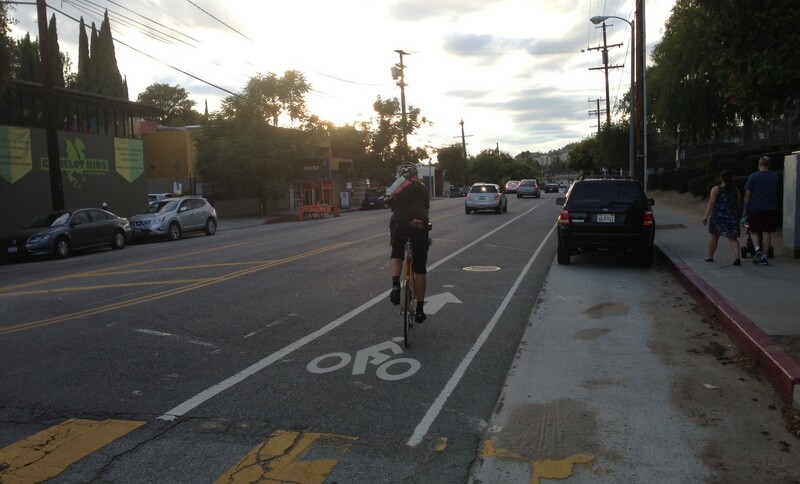 City of Los Angeles Bicycle Advisory Committee Member, Jeff Jacobberger. Jerome Courshon, 56, resident of Waverly Terrace in Silver Lake. Doesn’t like the road diet. This meeting felt really constructive. I went expecting the usual bikelash, but left feeling empowered. Lots of common ground and desire to traffic-calm the neighborhood. Kudos to Silver Lake NC for bringing us together. You should go back to school and learn the difference between opinion and fact. That young man is entitled to use that roadway, for you motorists it is not a right, but a privilege. Since you don’t understand we have to do things like this to help make you understand. Not quite sure what people are going to do as traffic gets worse (with a growing population). Having proper bicycle infrastructure in place is a great alternative. Multi-modal transportation options are the future for the Southern California region — even if people do not accept the fact. Everyone should have the right to feel safe on the road. The kid was great, honestly, probably a better person than the vast majority of adults. As for the road comment, I agree with this to no end. As a driver, you’re stupid to prefer a poorly designed 4 lane road to a well designed 3 lane road. I mean, you aren’t as likely to die in a collision, but you still might get injured. Just because the 11 year old child is more mature and had better perspective on things than some adults, doesn’t mean he’s acting as a proxy, there are just some really really immature adults. All good, but that mistake is now no longer made. Newer roads are built with either a center two-way turn lane or hardscape median and turn pockets, so the opportunity to diet them doesn’t even exist. you’re disgusting for saying that. your name is disgusting. that kid got some lines fed to him, or he’s a class a troll in the making. Drivers feeling superior to cyclists is not something a kid comes up with. Furthermore, this phenomenon afflicts drivers as the same rate as cyclists, it’s nonsense. You’re disgusting. Take a hike. Again, why is it so inconceivable to you that an 11 year old might understand when someone driving a car treats them poorly. (b) cars pile up in the RIGHT lane waiting to turn RIGHT. This means that the through lane swerves back and forth between intersections. *This is a good thing* since it causes cars to slow down to the speed limit. Speed bunmps don’t work, but chicanes DO work. Most of the new roads in my area build right turn pockets as well, so cars turning right don’t back up in the through lanes. They usually also take the time to make sure that the path is straight to avoid deviations through intersections like you described. They almost always at a minimum have two through lanes and some have up to four. Per direction.